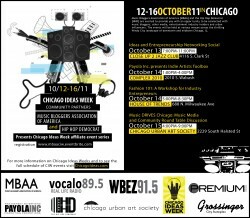 The highlight of CHHC’s interaction with Chicago Ideas Week was without question the Music DRIVES Chicago event on 10/16. 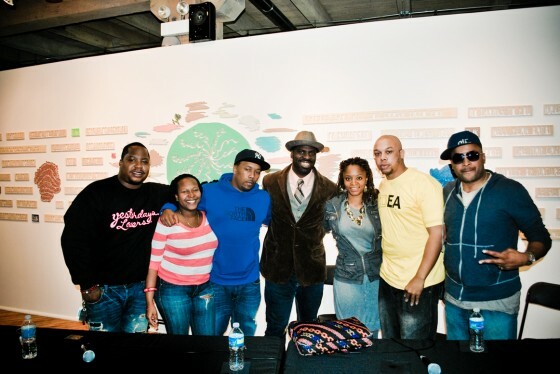 Presented by the Music Blogger’s Association of America (MBAA), and hosted by Dave Jeff, Founder of PHLI Worldwide, two groups of panelists came up to discuss topics surrounding the state of recorded music, media outlets and communities throughout Chicago. Both panels were impressively moderated by the host of The Music Vox (Vocalo 89.5FM) and Live in Studio 10, Jesse Menendez. His passion for the industry was expressed through questioning and challenging the minds of the panelists. Each member quickly had strong inputs throughout the discussion and the word “branding” was a reoccurring theme to the debate. Lara discussed the need for artists to put in the work on themselves in order to get the most out of blogs/media outlets. GLC discussed his experiences leading to his name on countless records with other industry leaders (i.e. 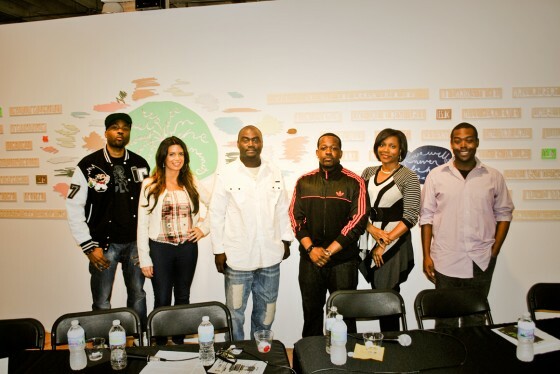 Kanye West, Rhymefest, Kendrick Lamar, Bun B, Kid Cudi, I could go on). Trey spoke heavily on his time with radio and the need for stations to break artists while Kyra shared her experience in online media with Redeye and her new projects. Naledge took branding to the next level donning an all-Adidas wardrobe, compliments of his work with the brand (a commercial is on the way, new album sponsor, vlog sponsorship, etc). Rashon pulled it altogether with his unique take from the perspective of the blogging community. This group added some energy to the room on the issue of accountability. Should artists be accountable for the citizens and communities they once and/or still call home? Briahna exhibited her passion for educating the youth on the reality of the business versus perception. Carl West took the other end of the spectrum suggesting artists will not change, and those like Rhymefest and Lupe Fiasco are exceptions to the rule. Fest and Ayesha (Lupe’s sister) challenged Carl, and the event might still be going on if the space (the beautiful Chicago Urban Arts Society) wasn’t used for something else. The night was truly remarkable. Seeing all types of different (but at the same time similar) people come together to have a conversation is encouraging for the city and Hip Hop as a whole. Thanks to everyone involved, and please consider us for all of your future accomplishments. Check out the slideshow below for some other photos!